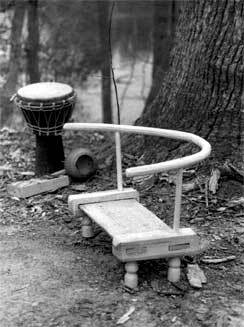 Just as we transform the wood into a chair, so too does the chair transform a man from laborer to philosopher. All day long a man works in the fields, but at the end of the day, he washes up and changes his clothes, throws his chair over his shoulder, and goes to join a circle of friends for the evening. When he dies, the chair passes on to his son and the circle carries on. Eight pieces of wood make up this chair from the Ivory Coast. Its design, and the tools used to make it, combine the cultures of North and South. The Ivory Coast has shared the culture of the French since the 1400s, so we undertake this African chair using the tools of the French colonial period. Start with the steam-bent bow so that it can be setting up. Split the bow from white oak or hickory or ash and shave it down to about the thickness of your thumb. If the wood is dead green, you may be able to bend it without steaming or heating. Otherwise, you will need to place it in a pipe and fill the pipe with boiling water or stick it in a steam box for half an hour or so. (The steam box is simply four boards nailed together with a perforated pipe running down its length connected to a kettle of boiling water.) But anything that gets sufficient heat into the heart of the wood will work. Once the timber is limber, you can bend it around your knee, increasing the bend as you move it along to gauge the evenness of the flexibility. A stiffer part gets more pressure to bring it into compliance with an even arc. When the bend is judged right, use a stout cord to pull it into a bit tighter curve than you want in the final chair. Set it aside for a day or so, and it will set up and hold the bend. Man's Chair from the Ivory Coast Drawing. Click on the image to see a larger version of the image. The sides are blocks of oak about two inches square and eight inches long, with the ends trimmed to blunt pyramidlike convergences. 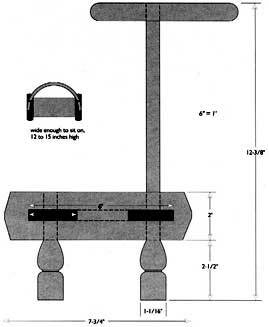 A good device to hold the side blocks for morticing is the traditional French chairmaker's bench, a low four-legged stool with peg holes in the top. The blocks go against two pegs on one side and are forced tight by a wedge driven in against a third peg. Chop two mortices all the way through with a groove between them for better housing the seat. Again, splitting the wood from the log if you have it, make the seat l/2 inch thick, 6 inches wide, and 22 inches long. Cut the ends into tenons to fit through the mortices in the seat blocks. 1 used another French design, a folding springpole lathe, to turn the four legs. The two front legs are only about 4Vz inches long, so its easier to turn them in tandem (end-to-end) from the same stick of wood. The back two legs are about 14 inches long and extend through the seat blocks to support the back bow. Assemble the seat into the sides and bore through the blocks and tenons with a brace and bit. Set the legs through the holes, locking the tenons of the seat into place. Now take the bent back bow and set it over the extended back posts so that it is positioned as you want it. Mark the places of intersection and bore on through. Fit the bow in place over the posts, and you are done. This is a low-riding but beautifully proportioned version of this chair. Many such chairs sit a bit higher. Most important, these chairs are a form distinguished by their individuality. The proportions and height vary widely within this same basic design, so they are rewarding little things to make, as individual as the people who own them.